Gift cards holders are fun to make and these have a quick and easy closure. Like many other crafters, I believe that gift card holders are a great way to personalize a gift. The problem comes with finding a way to close the holder. I wanted something that you could open and close multiple times, was inexpensive and didn't add bulk. And quick and easy was important too! 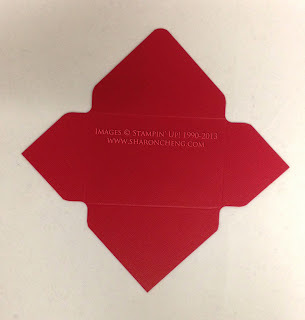 This is what I designed--a slit on the back of the gift card holder. 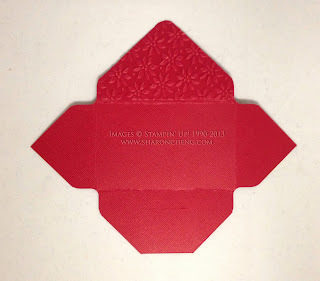 It holds the gift card envelope closed, doesn't add bulk, and is quick and easy when you use Stampin' Up! 's envelope punch board (133774 $19.95) and Stampin' Trimmer (126889 $29.95). 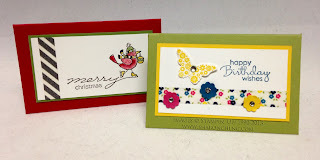 We made the Happy Birthday gift card holder in my stamp club. Everyone agreed that this was a fun way to make a gift card holder with a quick and easy closure. 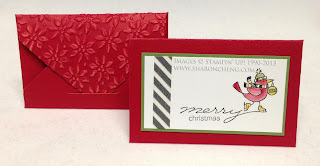 The first step is to make the Gift Card envelope using the instructions on Stampin' Up! 's envelope punch board. It only takes a 5x5 piece of card stock. 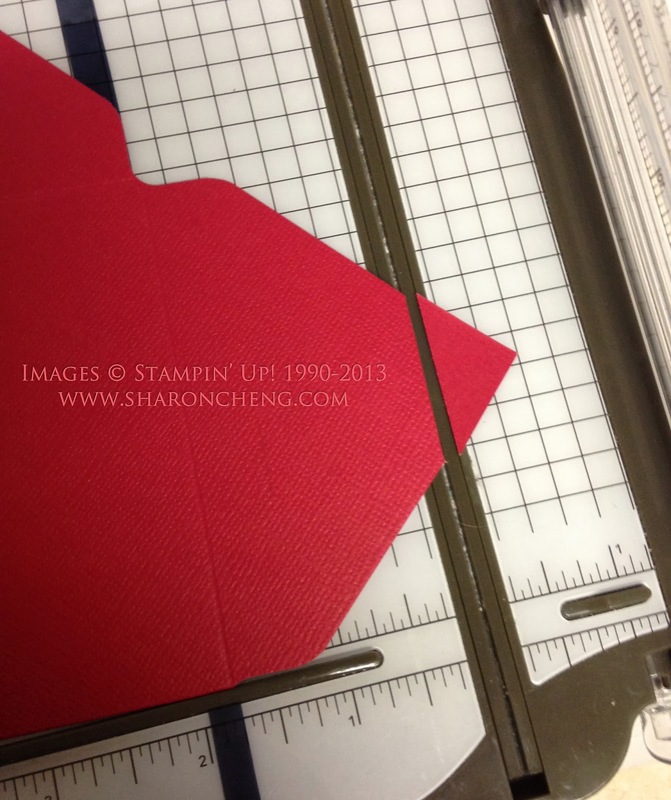 Cut off the tip of what will become the bottom flap of the envelope. Here is how I measure how much to cut off. Notice that I folded back the side flap so that I could line up the score line for the bottom flap at 1 3/4". 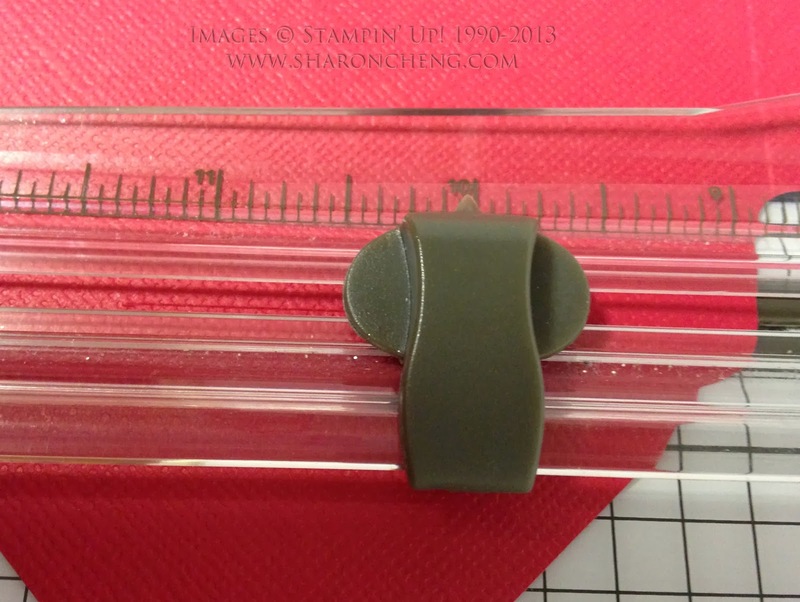 When I'm working with small items, I prefer to use the bottom part of my Stampin' Trimmer? Why? As a physical therapist, it's easier on your neck, back and eyes to keep your work close to you. When you use the top of the trimmer, you have to lean forward more. 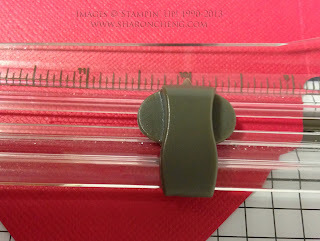 Reposition the envelope so the score mark is at 1/2". Then cut from the 10 to 11 1/4" markings on the top of the guide. Remember that I'm working from the bottom of the Stampin' Trimmer! Decorate the envelope to fit your artist's eye, adhere the bottom flap of the envelope to the side flaps and the gift card is done! I love this Sharon! So easy, but sooo useful! I think I might have to get the envelope board!